As seen on the map, the western portion of Line 89 is split into two halves, a northern “via Bronson” one and a southern “via Cornell” one. Buses alternate between the two, and the line operates hourly on the weekends. 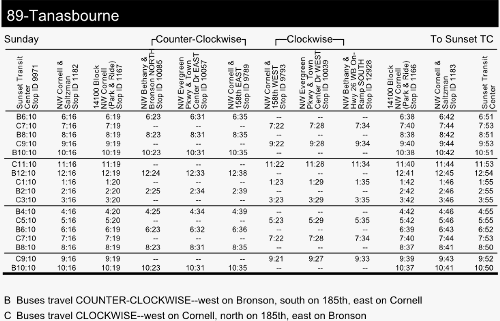 It is not evident that the buses actually switch between the Bronson and Cornell halves at the western end of the route and continue on the other one back to Sunset TC. Moreover, given the low frequency on the route, this is very useful–many times taking a bus that’s currently headed towards Tanasbourne (the opposite direction) will get you towards Sunset TC earlier. 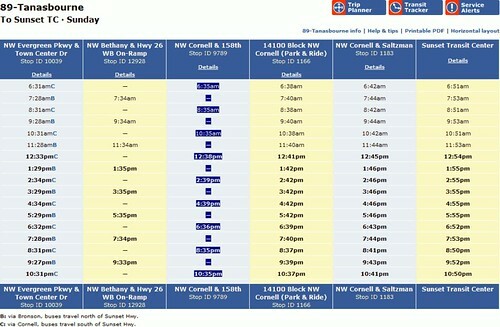 On weekends, as the highlighted column in the image above shows, buses only travel each direction of each half (e.g. east on Cornell) every two hours. In addition, this would also help people trying to get between the two halves of the route. 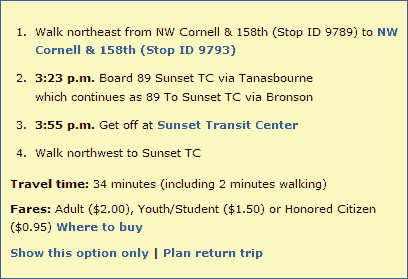 The “To Sunset” schedule (top) sounds like all trips start at the same stop, when half of them actually start at the stop across the street. 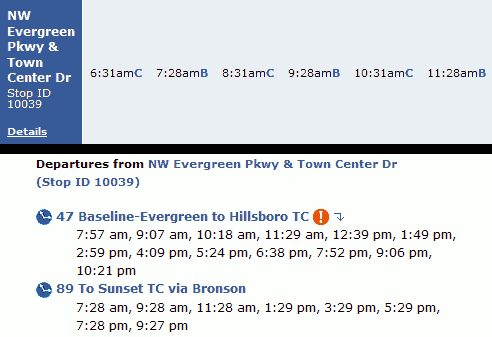 The trip planner (bottom) correctly shows that only the “B” trips actually stop there–that there really is no 6:31am, 8:31am, 10:31am, etc Line 89 buses at Stop ID 10039.